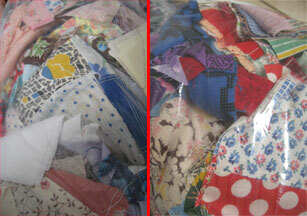 Home » quilting » >The fabric, it calls to me. >The fabric, it calls to me. >I don’t know what it is, but I have been hearing the siren song of vintage calling to me all week- and ya know, if you listen- it will come… (just like field of dreams, but for girls instead). Monday or Tuesday I heard the swan song of the Goodwill, and it was true. Yesterday I heard the estate sale calling to me, and it was true. Today I heard Salvation Army and Amvets, and they came true, too! But the antique store? False alarm. You win some, you loose some. This is a story of a sad little plastic bag. Actually, two little sad plastic bags, thrown on the bottom shelf of the often neglected craft section of the AmVets thrift store. In amid cast off knitting needles, macrame, and half completed cross stitch samplers, they waited patiently for someone to find them. Although they may be ugly to the eye of most vintage mavens, I know that there are sometimes diamonds in the rough, so I pawed and turned over the sad little baggies, and spotted what could possibly be a promising little bit of evidence of a prior, pre 1980s, life. Can this be? Vintage feed sack? No, it must be repro! But look at the weave! Look at the thickness? *paw paw* Yes, it is indeed! So I came home and dumped them all out over the floor, and there they are! 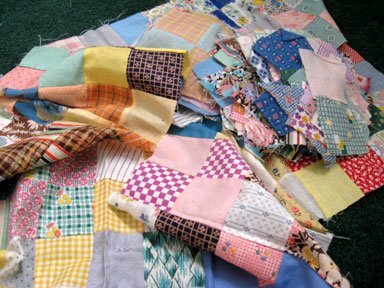 Lovely little pretties from the 30’s to the 50’s that someone, at one time, was making a quilt out of! Hurrah! 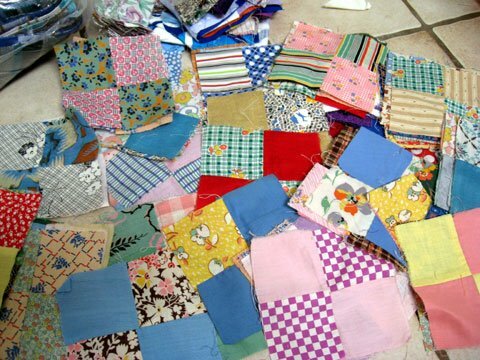 Do I need another sewing project? Heck no! But these are awfully pretty! Think of the dresses they might have been! Isn’t that the most romantic part about finding vintage? 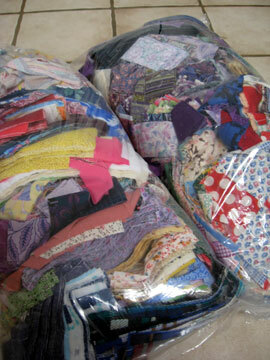 I love coming up with stories of the past owners, or stories for the fabrics themselves. Oh, and btw, here’s all the parts left over. Oops? Up to etsy they go. 3 Comments on >The fabric, it calls to me. >I have just found your Blog through Fleur de Guerre. 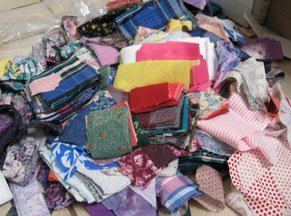 I love all your chats about your projects and it is just the inspiration I need to start tackling my huge cupboard of neglected fabrics. Thank you!